Michael J. Fox's Parkinson's may have made him a better actor. The star of NBC's upcoming The Michael J. 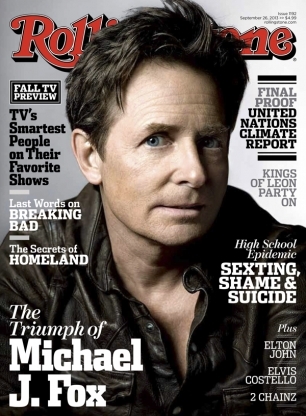 Fox Show, in which he plays a news anchor struggling with the disease, explains in a cover story for Rolling Stone that after he was diagnosed with Parkinson's, he began to change his physical reactions in scenes, which altered his approach as an actor. "I had a certain fluidity to my movements and rhythm of speech and a physicality that I had depended on," Fox tells the magazine. "It served me really well, but when that was taken away, I found that there was other stuff that I could use. That hesitation, that Parkinsonian affect, is an opportunity to just pause in a moment and collect as a character and respond to what's happening and just gave me this kind of gravitas. It really gave me a new view of things." The disease seems to have also taken away some of his acting anxiety. "I used to be really nervous," Fox tells Rolling Stone, "and sit in my dressing room and fret about a scene that was coming up and sweat it out and say 'What am I going to do? You say action and I have to do something. What am I going to do? And what's that actor going to do? And how do I respond to that?' And now it's just like 'Okay, what's happening?' And something happens, I react to it and if nothing happens, I don't react. I don't worry about that bit I was going to do or the look I was gonna give because when I get there I may not be able to give that look or do that thing or move that glass." The show, which has already received a 22-episode order, is set to premiere Sept. 26.